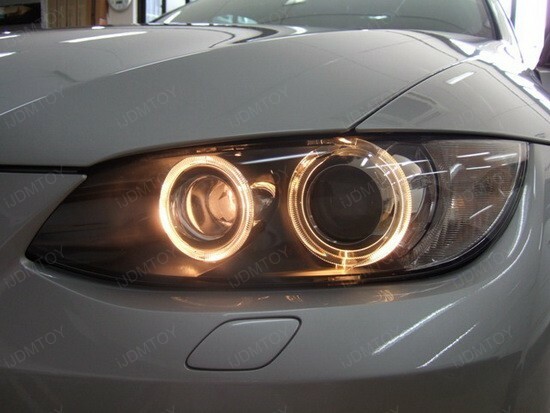 This project involves upgrading the stock BMW Angel Eyes of a 2010 BMW 328i to LED ones. We were very pleased with the result, and so was the owner of this beautiful Bimmer. The first thing any driver will notice is the unique blue color. 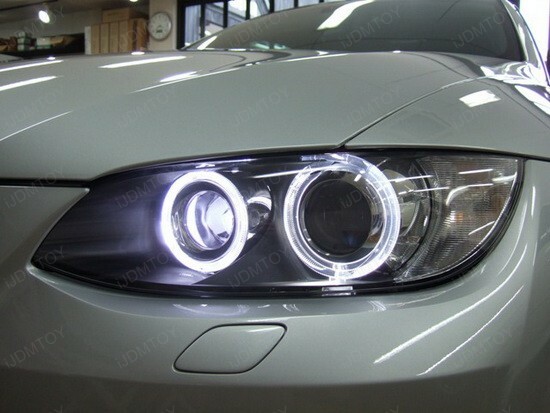 As you see, there is a huge difference between old yellowish BMW Angel Eyes and LED BMW Angel Eyes, as the LED gives this E92 a classy and a sleek appearance. Installing this product is as simple as putting the biscuit in the basket? It’s a plug and play. But you should have in mind that for the High Power LED BMW Angel Eyes to fit, the BMW must have factory equipped HID Headlights. It sure fits in 2010 BMW 328i, as well as all E92 above 2008, but for a complete compatibility list, please check out the product description on our website. One of the coolest things is that these specific BMW Angel Eyes are completely error-free. Thanks to the special designed Error Free Decoders, there will be no more dashboard errors and no blinking issue with this high end profile product. It’s nothing more than a perfect upgrade for this 2010 BMW 328i. Let’s reveal some of the secrets of the LED BMW 328i Angel Eyes. The wider 60 degrees arms make the high power LED bulbs much closer to the angel eye opening, so it looks much brighter than the stock BMW 328i Angel Eye rings, and consumes less energy. The cooler tone adds a sleek and modern appearance and in addition to the brighter output, the cool color becomes even more noticeable. So, it sure sounds like a total win, and if you want to improve your BMW, this is your chance. BMW LED Angel Eyes is nothing less than a good deal any driver can invest upon, as better lighting means safety on the road. And when we saw them at night, well? They were hell of a nice touch to this 2010 BMW 328i! Brought to you by iJDMTOY.com, the expert for your Car LED Lights. Follow us on Facebook for exclusive promo codes. This entry was posted in - LED & HID Updates, BMW and tagged 2010 BMW 328i, BMW 328i Angel Eyes, bmw angel eyes, BMW E92 3 Series, H8 Ring Marker Bulbs, high power by Eric Wu. Bookmark the permalink.